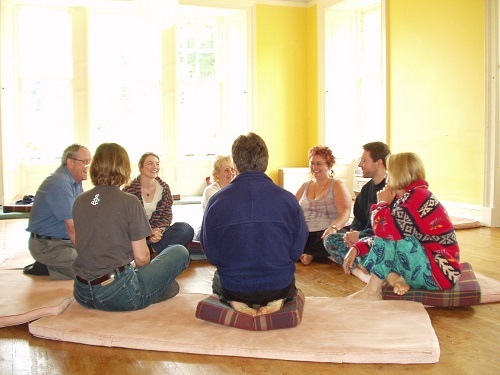 What is a co-counselling workshop at a residential? If you go to a co-counselling residential you will experience people each morning in the opening circle offering ‘workshops’. You might wonder what that means. There is a kind of classic format, which is not written down anywhere in any rule-book, but here is what happens in a ‘straight down the line’ co-counselling workshop’. Let’s suppose you are interested in working on a certain issue or theme: the theme could be, for example, death, eccentricity, ageing, food and eating, intimacy, friends, my home, schooldays etc. You can offer this workshop yourself. People who sign up for your workshop meet for an agreed length of time, typically a couple of hours. First, have an opening circle, e.g. a round of names and a quick check-in: ‘How I am feeling right now’. Next, a sharing round. I like to ask: ‘What has drawn you to come to this workshop’. This is good to get people ‘warmed up’, to be emotionally ready to work on their issues. Next, for the majority of the time, have sessions. I usually like to have this in a group, with equal time. This is something I often prefer because it keeps the energy in the group. Practically, it works like this: say there are 6 people, and two hours. Each person is client for 16 or 17 minutes, during which time they have the attention of, and potentially interventions from, each and any of the other 5 counsellors. The client may elect to have interventions from one counsellor and free attention from the other 4. (I said ’16 or 17 minutes’ and not ’20’ because you want to have a bit of extra time for swapping over, pee breaks etc.) The alternative to having a group is simply to split up and do sessions in pairs or three’s. Next, have a closing circle, e.g. ‘What I am going away with’. This might seem rather simple, and it is a simple format. But lots can come up. Try it out, if you have not yet done so. But NB, there is a risk in offering a workshop: people might not come! They may prefer to go to a competing workshop, or have an afternoon off – walk in the woods etc. So, you may have to face feelings of rejection – uncomfortable, but maybe useful. I like to offer workshops that really challenge me to face things I find difficult. Some of these are straight ‘co-counselling’ workshops that have a strong element of co-counselling, and others are ‘non-co-counselling workshops’. In such a format the ground rules of equal time may not apply, and there may be an interpersonal element. Note that the normal co-counselling contract deliberately leaves out of the equation any addressing of the interpersonal relationship between client and counsellor. If you want to read more about these workshops click here.